On 9 September 2013, the annual scholarship ceremony was held to honour the international students who have been awarded a scholarship to study at Lund University. The ceremony took place in the assembly hall in the main university building, which was full of scholarship holders and donors. This year, a total of 183 scholarships have been awarded to students starting at the university in autumn 2013. This includes 108 scholarships from the Lund University Global Scholarship Fund, awarded to talented students to cover the cost of tuition fees. A further 75 students at Lund University received scholarships from the Swedish Institute that cover tuition fees and living costs. This year, the scholarship holders came from around 30 different countries, including the USA, China, Russia, Taiwan, Gambia, Syria, Kosovo and Argentina. Vice-Chancellor of Lund University Per Eriksson congratulated the scholarship recipients and talked about how, in his student days, the peaceful social engagement of the students led to major changes in society. Both donors and students spoke about the importance of giving and receiving scholarships. 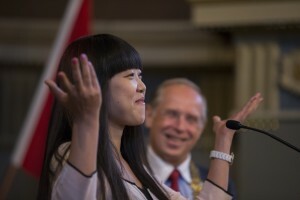 A Chinese student, Xinyu Hu, who will be studying the Master’s programme in European Business Law, spoke enthusiastically about how the scholarship had enabled her to study at Lund University. Other students described the chance to study alongside top students at Lund University as a dream come true. 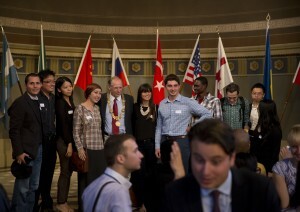 The ceremony was followed by photographs and a welcome drink for all new international students at Lund University. Since Sweden introduced tuition fees for students from countries outside the EEA in 2011, the number of students from these countries has fallen by over 80 %. This has made it more difficult to maintain provision of English-language teaching at Master’s level, which in turn leads to a general reduction in numbers of international students. In order to reverse this negative trend, Lund University needs to be able to award scholarships. The diversity of knowledge and experiences that international students bring is important to the development of Lund University.